Announcement Sterling Silver Jewelry embedded with gemstones and pearls. Silver engagement rings, silver rings, silver earrings, silver necklaces, gemstone jewelry and more. Welcome to my unique nature inspired handmade jewelry shop! The inspiration for my jewelry designs is my garden, the nature, wild trees, flowers and birds that surround my home studio. All the sterling silver jewelry in my shop is designed and hand crafted by myself and made in small series (some are even one-of-a-kind). My jewelry is very delicate and would be a wonderful gift for your loved ones or for yourself. Please do not hesitate to contact me if you have any questions about your order, product information or shipping. Sterling Silver Jewelry embedded with gemstones and pearls. she was wonderful to work with as my ring was damaged in shipment. i would not hesitate to order again! I absolutely love this ring with all of my heart. It was very important for me to have my ring made in Israel and I'm so lucky to have found Efrat. Thank you so much! Shalom! Work in Process - Soldering a Ring. Just a perfect romantic gift for your loved one or for yourself. Available with other gemstones too! My Handmade Amethyst Silver Jewelry - Do you know that Amethyst is February Birthstone? I design and hand craft unique sterling silver jewelry, some of them embedded with enamel, gemstones or pearls. My garden and the nature, the wild trees, flowers and birds that surround my home studio are the inspiration for my jewelry designs. I love working in my studio while listening to the wild birds that visit the big oak tree near my window. As a former biologist, it was obvious to me, even when I was just starting to learn metalsmithing, that the wonders of nature will be an important part of my designs. Each piece of my sterling silver jewelry is hand made with love and care from materials of the highest quality. I graduated metalsmith studies at the WIZO Haifa Academy of Design and Education. I live in Timrat - a small village that overlooks the Yizrael Valley, located in the Lower Galilee region in the north of Israel. I love photography, working in my garden and hiking in the nature. I also love to travel to other countries, to meet and learn about other people and cultures, and to visit different places. 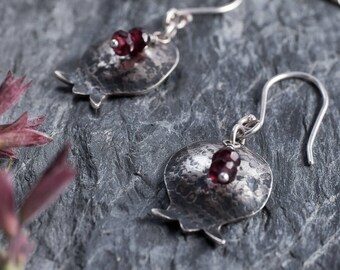 I design and hand craft nature inspired unique sterling silver Jewelry, some of them embedded with Gemstones, Pearls and Enamel. I live in Timrat - a small village in the Lower Galilee in the north of Israel. I love to work in my home studio. A small family workshop specializing in silver and gold casting. I design and make my own jewelry. In some of my jewelry I use their expertise to cast a finished model designed by me, in sterling silver. I may store and process your information through third-party hosting services in Israel, the US and other jurisdictions. As a result, I may transfer your personal information to a jurisdiction with different data protection and government surveillance laws than your jurisdiction. If I am deemed to transfer information about you outside of the EU, I rely on Privacy Shield as the legal basis for the transfer, as Google Cloud is Privacy Shield certified. •	You may have the right to receive a copy of the personal information I hold about you by contacting me using the contact information below. ***-Regarding to access, correct or delete personal information held by Etsy and not held by EfratJewelry, please contact Etsy.com/help directly for assistance, or send a request directly to Etsy. Shipping cost for the first item is $9 only. Additional items are free of shipping charge. All items are shipped by registered air mail with a tracking code. 1) UPGRADE to EMS Express Shipping. It takes about 4-7 business days to arrive. 2) UPGRADE to Express Shipping by DHL. It takes about 2-4 business days to arrive. The additional rate is $28 ($37 total). For the express shipping, Please add your phone number so they would be able to coordinate the delivery. During the holiday season shipping time might be slightly longer. If your PayPal and Etsy addresses are different, PLEASE let me know which one is the correct one. Each piece of jewelry is placed in a nice gift box and tied with a beautiful ribbon. The box is placed in a padded envelope. If you want me to send the item as a gift to a different address, please let me know. If you wish, I can add a nice greeting card, and print your greeting on it, without additional charge. I make my jewelry with a lot of love and care and it is very important to me that you will be happy with your purchase. IF for ANY reason the jewelry you bought does not meet your expectations, please notify me within 7 days of receiving it and if we cannot work it out I will refund you (not including shipping costs), as soon as the item arrives back at my address. The item must be returned in its original box, in new and unused condition, by registered mail with a tracking code. I am always glad to create custom designs that will suit your needs. If you like an item at my store but would like to make some alteration to it, such as stone color and type, ring size or anything else, please contact me with your request and I will do my best to create a new custom made piece according to your request. I reserve the rights to use any of that custom order items designed by me and add it to my store as a new product. Please note that colors may vary depending on your computer monitor. Please take note of measurements on jewelry description before purchasing. The pictures are taken in macro mode on a digital camera, so sometimes a jewelry might seem larger then it is. ** WHERE DO YOU SHIP TO ? I ship worldwide, to all countries that have postal relations with Israel. ** Who is responsible for paying charges as import taxes, customs, VAT, etc. when ordering from abroad? PLEASE NOTE: According to Etsy's policy, buyers are responsible for all charges that are applied in their country when they are ordering from abroad. This includes VAT, customs, import taxes etc.